If you are organizing your own colored cornstarch event, this is an example of basic information you need to share to get the word out. Runners will run through town, through Totem Park towards Reid St., passing Angerman’s playground, down City Market hill….ending back at City Dock.Colored powder to be tossed by runners and volunteers - wear white! SPLASH DASH 5K Fun Run!! 50lbs of color headed north to Alaska!! 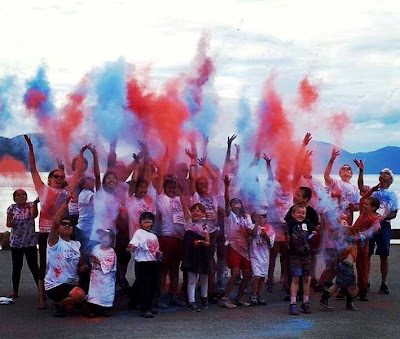 Come out and celebrate community, family, health and 4th of July for Wrangell’s first run with color! Round up your buddies, wear white, stretch your hammies and get some color in your teeth and all your cracks! This event is a fundraiser for the Garnet Grit Betties, our local Roller Derby girls! Registration is $45, which includes a GGB t-shirt, 1 pair of Pit Stop Shades and a small pack of color to toss. Come out and celebrate the 4th July, community, family, health and summer! !